"Late night Dim Sum!?!?" exclaimed Boss Woman, when I mentioned it a couple of weeks ago. She was thoroughly intrigued at the notion of Dim Sum at 2:00am in the morning. Hey, I've been lobbying for this since I can remember. 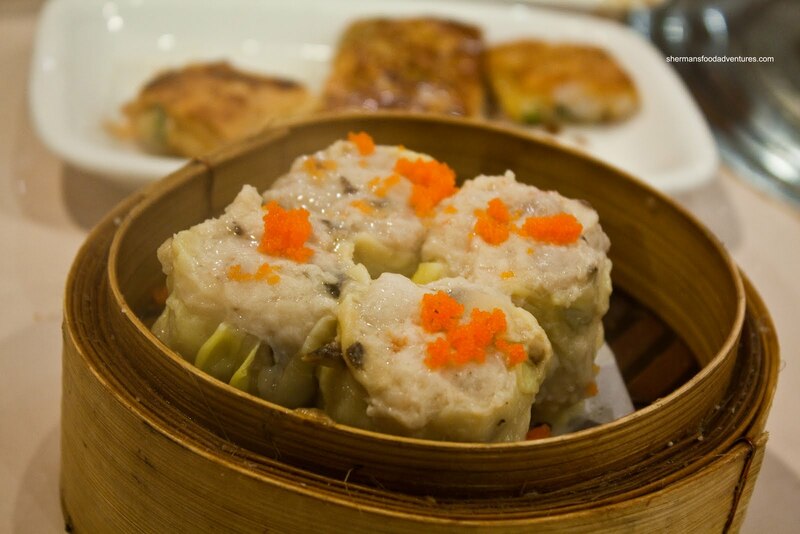 Why can't we have Dim Sum 24 hours a day? Well, it is readily available in Hong Kong... But then again, we're not in Hong Kong right? It's good for breakfast, lunch or dinner. Heck, I even steam up frozen Dim Sum at home to eat as a snack! Mmm... Chicken feet while watching the hockey game... So, seeing how we had another game at 11:30pm on Friday, there were not many eating options available afterwards. 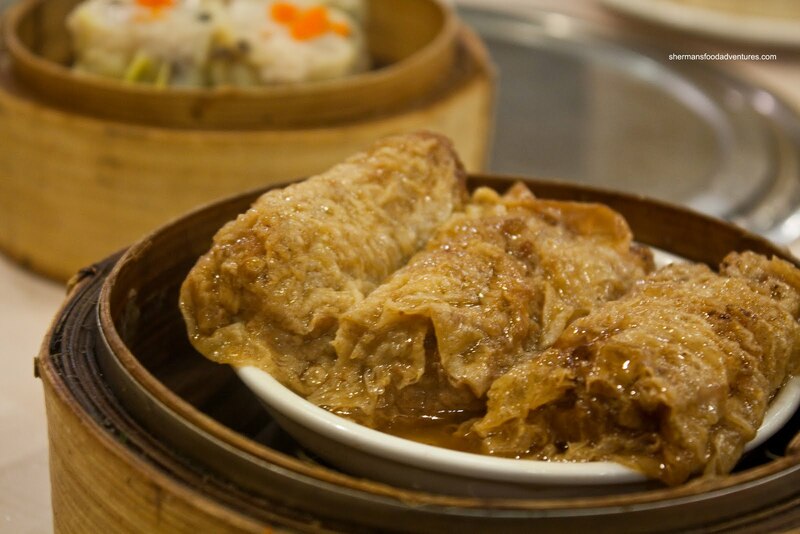 Perfect time to go for late-night (or early morning) Dim Sum! One problem. It's in Richmond. Okay, before you flame me for hating on Richmond again, it's not about the drivers. C'mon, at 2:00am in the morning, there are practically no cars on the road. The real issue was that we were playing hockey in North Van. 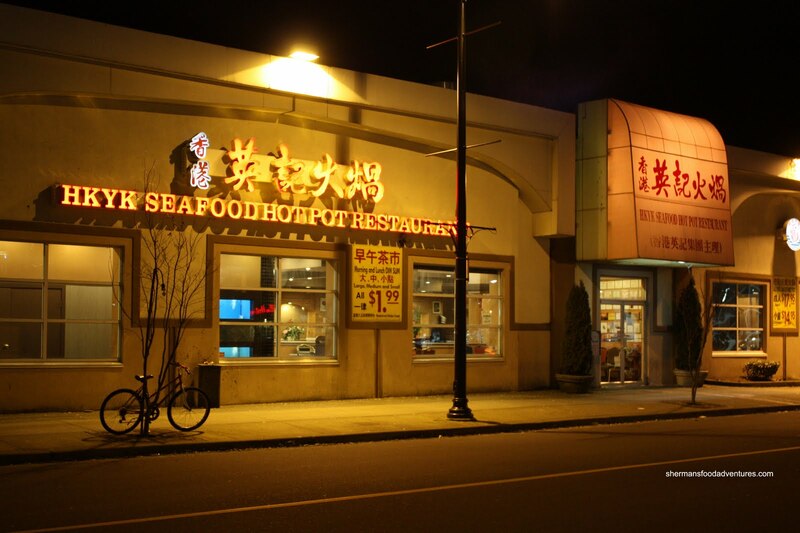 Yup, North Van to Richmond for eats. We are dedicated or completely nuts. Walking into the place, it was evidently clear that there was no heat. Looks like they were dependent on the hot pots to keep everyone warm. One problem - we were not having hot pot! Thus, we were freezing since it was -5 Celsius outside! I'm sure it is a violation of some sort to not have heat, considering the temperature outside. 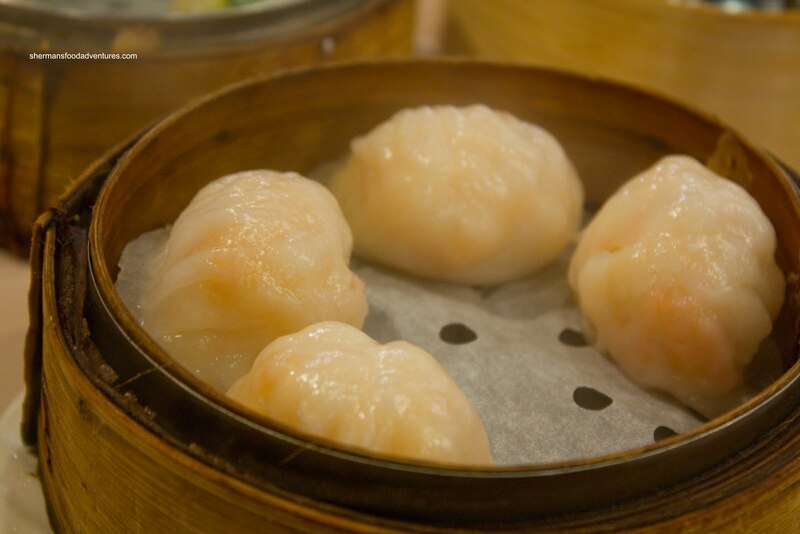 Since it was not exactly the height of normal Dim Sum hours, there were only a limited amount of items available (many were sold out). Everything came pretty much at the same time, so there was no real order. 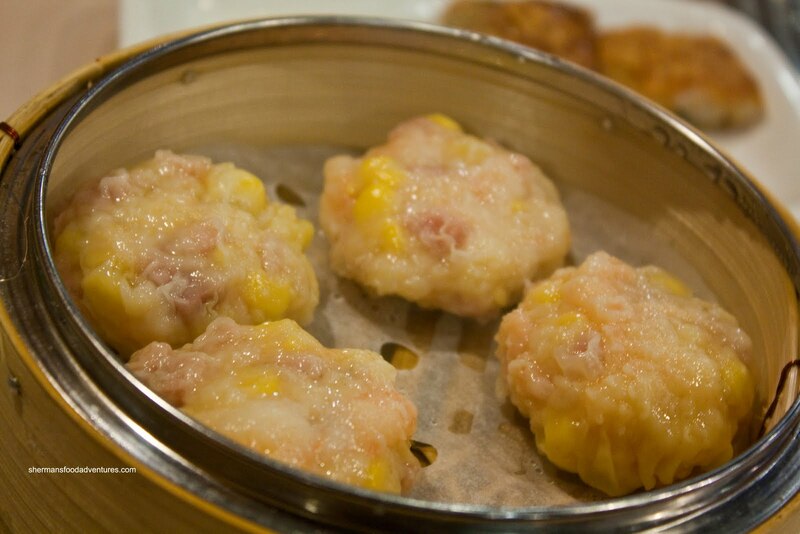 Therefore, I'll just start with the most important item in the Haw Gow (Shrimp Dumpling). Very large with a slightly soft skin and packed with a combination of shrimp and shrimp mousse, these were actually quite good. I wouldn't say they can compete with the best in town; but they were above average. Too bad I can't say that about the Sui Mai. These were absolutely disgusting. Probably the worst sui mai I've ever had in my life. 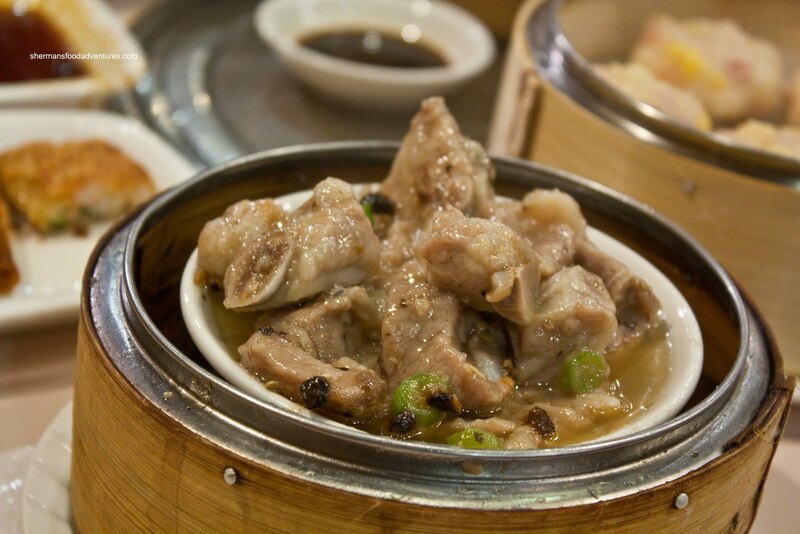 Normally, the desired texture of the pork would be somewhat chewy with a bounce-like texture. This is normally achieved with a good mix of meat and fat which has been tenderized (sometimes with baking soda). With this one, not only was the meat not tenderized, it was in big chunks of dry meat that was chewy and hard. It was like eating a big piece of shoe leather. To add insult to injury, there was no flavour whatsoever. It tasted like cardboard. Oh, and of the people who think I'm exaggerating, I've tasted cardboard unwillingly when I tried to open a box with my teeth. So I know the taste! LOL... Stay away from these at all costs. Normally, I wouldn't order the Xiao Long Bao at a Cantonese restaurant because they just don't do it right. However, with the limited selection available, we decided to give it a go. 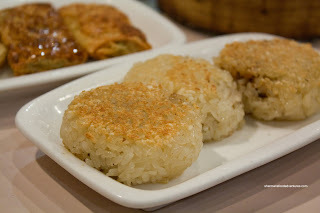 Now, I wouldn't say that the XLBs were good; but they certainly were a lot better than I expected. 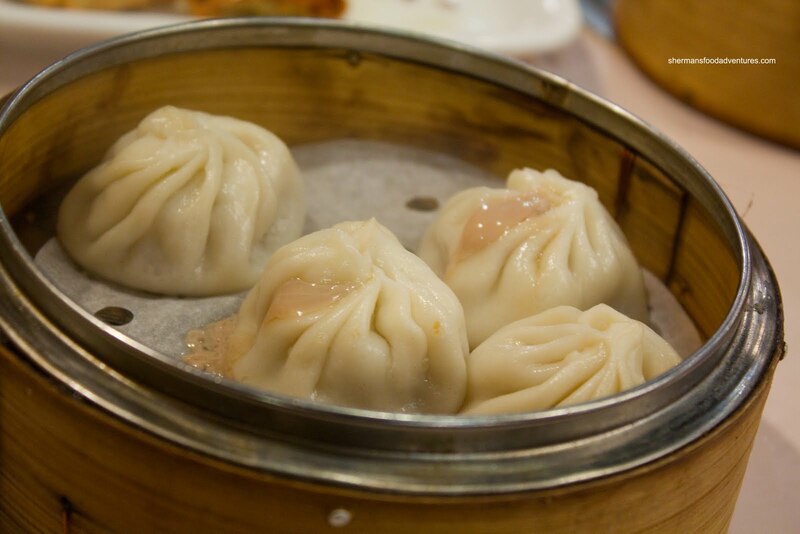 The dumpling skin was thick; yet it was easy to eat. The filling was actually quite tasty and there was some juice inside, so I'll give this one a passing grade. A little oil-logged, the Shrimp Spring Rolls were not bad. They were sufficiently crunchy; although with every bite, there was a side of grease to go with it. 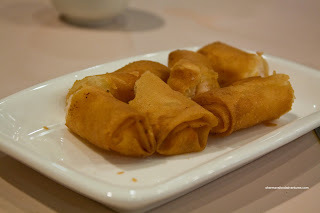 Another variation along that theme were the Fried Bean Curd Rolls. Bean curd skin replaces the wheat wrappers. These are "pan-fried" (more like fried) and served with Worcestershire sauce. Filled with shrimp, much like the spring rolls and greasy as heck, also much like the spring rolls. Next, we had the Fried Eggplant with Shrimp Mousse. Interestingly, they did not cut them up so we could actually share the dish. They did it for the spring rolls and fried bean curd rolls... Anyways, these were alright. 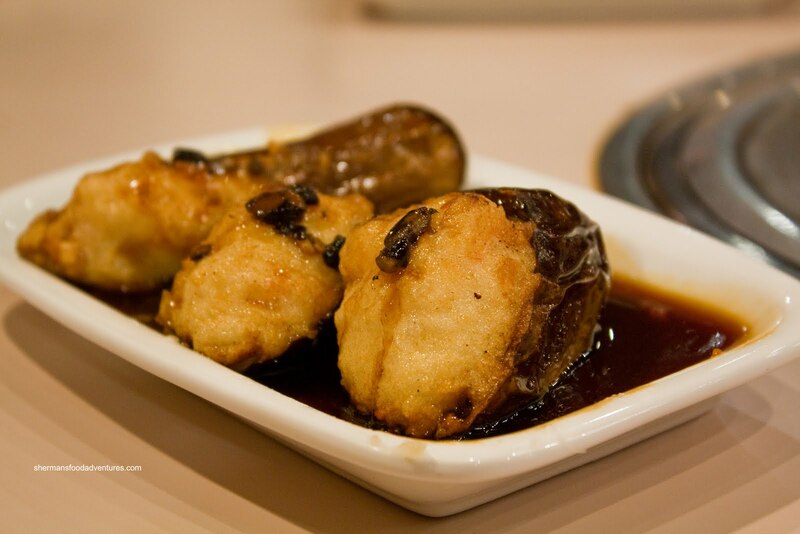 The eggplant was a bit overcooked and mushy while there was only a modest amount of shrimp mousse. The black bean sauce was a bit bland and watery. 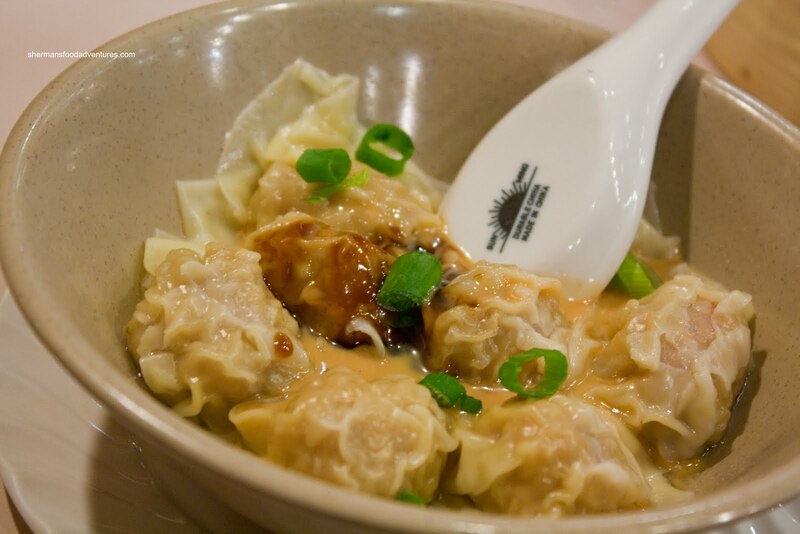 Another instance of "serves-me-right-for-ordering-it" was the Spicy Wontons. Not a Cantonese dish, I should have known better. By just looking at them, it was safe to assume they were not going to be good. These were neither spicy nor were they wontons. Sure, they look like wontons; but the meat was on the grittier side and they were only somewhat hot. It may have been victims of the cold environment we were subjected to. As for the sauce or shall we say a small dab of it, was bland. Heck, I could taste more the meat than the sauce. #EpicFail. Now for something that was good. We were a bit hesitant to order the Shrimp & Corn Dumplings; but due to our server informing us that the items we had previously chosen were sold out, we had no choice really. To our surprise, they were one of the better items of the meal (better is all relative though!). A mix of crunchy shrimp, sweet corn and ham, these had good texture and a nice balance of flavours. The next steamer of Pea Shoot & Shrimp Dumplings was also pretty good. Wow, a hot streak! 2 good dishes in a row. Yes, I'm being facetious here. 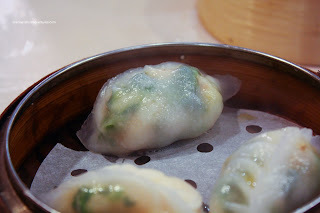 Packed with tender pea shoots and crunchy shrimp combined with a slightly chewy rice flour wrapper, they almost made me forget about the wontons and sui mai... almost. Exhibiting slightly chewier than desired ground pork, the Steamed Bean Curd Skin Rolls were actually not half-bad. Either we were beginning to lower our standards or they were actually quite decent? Lionel Hutz put it in perspective by stating that it was better than a lot of the other dishes we've had so far. Fair enough. 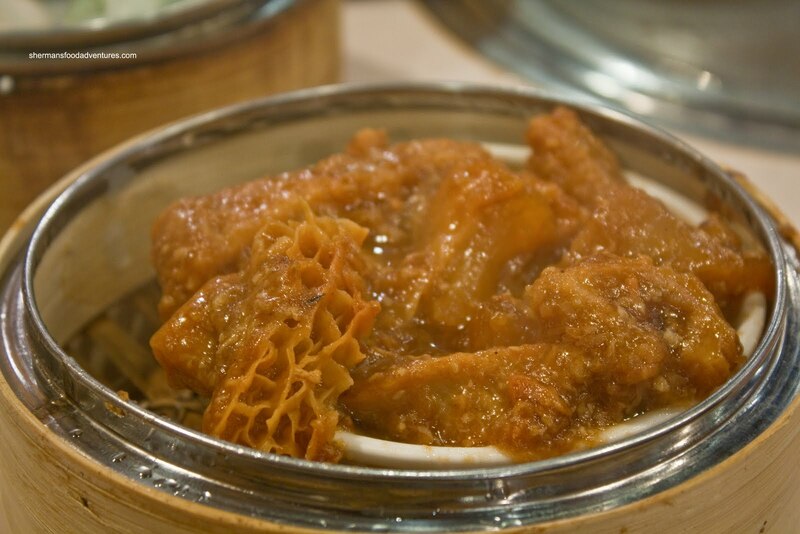 Flavour was good with the right amount of oyster-based sauce and the bean curd skin was tender. As mentioned, the only negative thing about the roll was the chewy meat. I get the feeling that they don't tenderize the pork here (like the sui mai). And this was confirmed with the Stea med Black Bean Spareribs. Hey, it looked good when it arrived. Full of large meaty pieces that were devoid of cartilage or fat, in actuality, the looks were deceiving. We found it difficult to gnaw through the excessively chewy meat. Once again, it begs the question: did they actually attempt to tenderize the meat here??? On the positive side, the seasoning was fine. It was a good mix of black bean, garlic and green peppers. One item that did not elicit much excitement other than Bos s Woman was the Steamed Tendon & Tripe. Lionel Hutz and Milhouse gave the "no thanks" look when I suggested we order it. I give them kudos for encouraging us to do so despite their non-participation. Turns out we ended up with the same response when it arrived. The darn things were so overcooked, it resembled the Wicked Witch of the West, melting before our very eyes. It's not good when tendon and tripe actually melt in your mouth like chocolate. Once again, at the very least, the flavour wasn't too bad, leaning towards sweet more than savoury. The last couple of dishes were of the Sticky Rice variety. The first being the traditional Lo Mei Gai (Lotus Leaf-Wrapped Sticky Rice). Normally, there are 2 versions of this particular item. 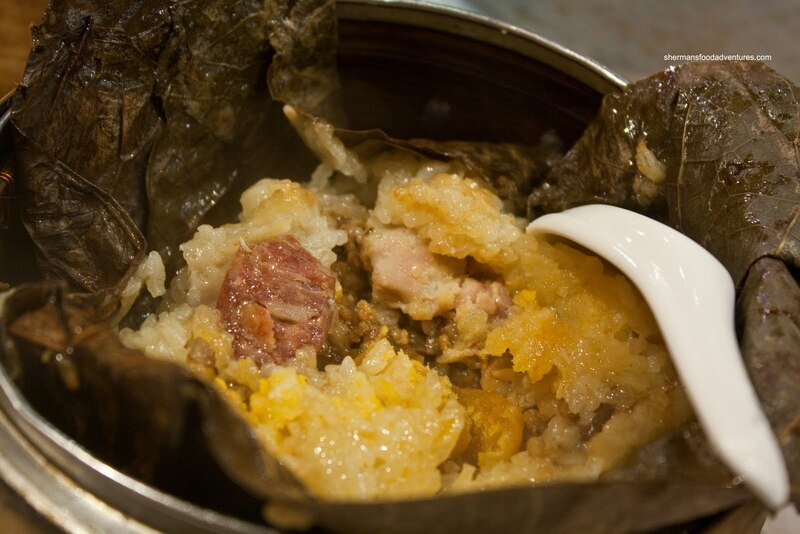 The "old" way is to have one large portion of sticky rice. The "modern" way is to have 3 smaller portions of sticky rice, which is easier to share. Now for the large portion style, it usually barely fits into the steamer. What we got was the larger size version; but it was not very large. Difficult to share and really not that much of it to share either. It was fairly mushy; but it was acceptable for what it was. Yikes! 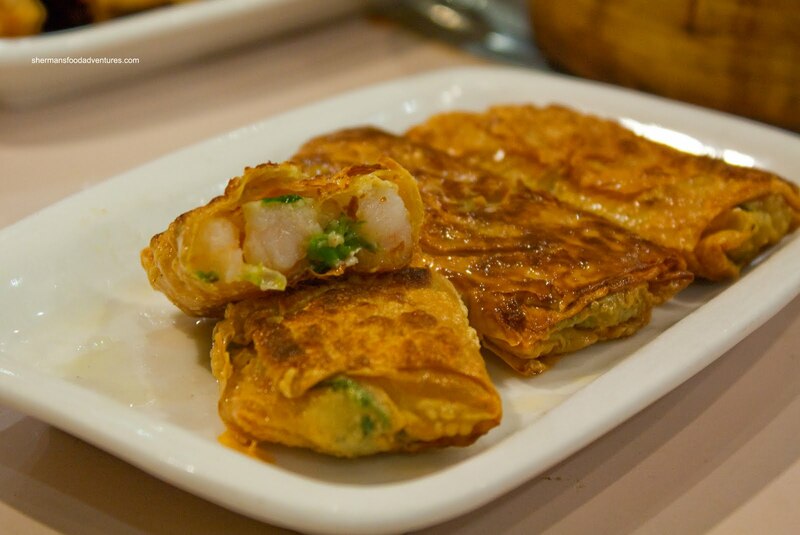 Looks like there's good reason for Dim Sum at 10:00 A.M.! It don't hold too well. Better off making it at home with that frozen stuff from the Gilmore joint. Dim Sum 24/7 at Sherman's!! @Karl Yah, I'd rather do frozen. What a bunch of crap we were served!